I came across this great music and video on our local TV station yesterday evening. It's a local Dutch band, Anthony's Putsch, singing about "going for a ride with my mother". Not all their songs are about cycling of course, but Dutch bands often seem to sing about cycling because it's something they all do. It's absolutely vital to get children to cycle. 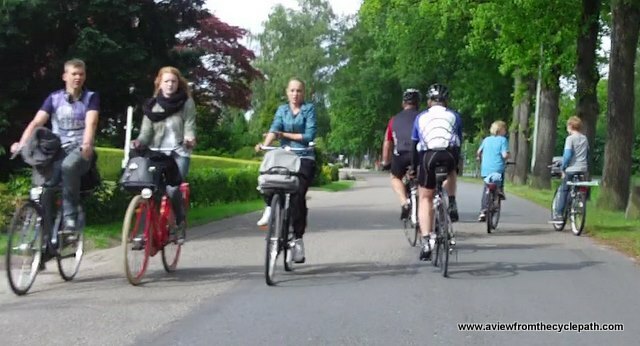 To encourage parents to ride with their children confidently and with a feeling of security and safety as shown in this video requires comprehensive safe conditions for cycling which are normal in the Netherlands. This is what has made cycling into a common experience which binds the nation. Why is this not normal everywhere ? I made three short videos during the study tour two weeks ago. As it happens, all three of them show children and teenagers using the cycling infrastructure in one way or another. Teenagers in one corner of a park in Groningen. It was a sunny afternoon, so thousands of people had ridden their bikes to different corners of this and other parks. It's similar if you cycle to the beach. In this video there's not so much cycling as walking. 6000 people, mostly from primary schools around Assen, take part each year in the local Avondvierdaagse. Participants walk 10 km each day on four consecutive evenings. Because of the number of people taking part they often cause a little disruption on roads and cycle-paths in and around the city, but this isn't the sort of thing that any reasonable person would complain about. Most, if not all, towns in the Netherlands have an event like this, modelled after the internationally famous Nijmegse Vierdaagse. The Nijmegen event attracts an amazing 45000 participants who each walk a minimum of 50 km per day (reduced to 40 km per day for people under 20 or over 50 years old) for four days in order to earn their medal. Why are children important ? Why do I concentrate so much on young cyclists ? That's easy to answer. Today's children are the only possible source of tomorrow's adult cyclists and children are a common interest of the whole population. Children love to cycle and cycling is a transport mode which can offer children a greater degree of freedom and affordability than anything else that is open to them. If we don't "get them when they're young", i.e. at the age when the affordability and freedom offer a unique combination then we must instead try to convince older people to take up cycling when they've already formed a habit of travelling by other means and when they can more easily afford other means. even over 75s make an average of one trip every three days. Countries which fail to achieve a high cycling rate amongst the young will struggle even more to achieve it amongst adults. Promoting cycling for everyday journeys is not the same as promoting it as a sport. As others have noted before, sports like swimming or playing tennis are worthy but they are of no use to travel to school or to visit friends. But cycling requires something that other "sports" do not. While any road design will suffice in order to transport people to a swimming pool or tennis court, those same roads very possibly will not suffice so far as making cycling attractive and accessible enough that people who are not cycling enthusiasts will see riding a bike as something for them. To achieve a high modal share amongst young children and teenagers requires our streets and cycle-paths to be so subjectively safe that not only do children feel safe, but that all their parents expect them to be safe as well. This is how the point is reached where children are given the freedom to travel independently. The avondvierdaagse youtube video (above) was made public a few days ago and one of the first comments asked "Where are the overweight children?". According to the figures I've seen, obesity levels in the Netherlands are somewhat lower than those of many other countries, but not actually near the lowest. As for what proportion of children are obese, that's difficult to judge. Some figures put this as high as 7% of the total, which would mean you'd expect to see two obese children in each classroom. Is this true ? I don't actually know as I don't work in a school and I've never studied this. It seems high, though. To my eyes there are obviously fewer really large people here than in the UK and that's despite our province, Drenthe, being worse than average for The Netherlands as a whole. I am given to wonder whether differences in methodology of reporting obesity might mean that little can be learned from the comparison of figures which come from different countries. I've seen the same thing with cycling modal share figures, which are almost never gathered in the same way in different countries. In fact, there are often several different conflicting figures available for modal share even for the same town. Dutch children have the same taste for overly fatty food and soft drinks as those who live elsewhere. However, unlike children elsewhere, the great majority of Dutch children walk or cycle to school. It doesn't stop with getting to school, though. School trips are by bike too (including regular weekly trips to play sports) and children make trips to go shopping, visit friends or buy fast food by bike as well. Without the cycling habit (12 to 16 year olds each make an average of about 1.7 trips by bike each day), it is very likely that obesity would be a bigger problem here than it is. In my view, adults owe the next generation the best start in life and the best future we can possibly provide them. If children can cycle then they already have a head start. The freedom of Dutch children is a good part of what makes this country score so well on the UNICEF index. 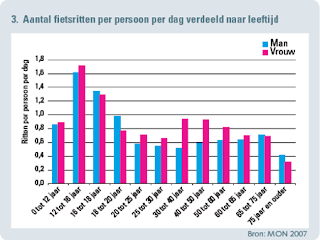 Dutch doctors find that cycling helps to treat many ills amongst adults. Dutch companies gain a competitive advantage due to their cycling employees. The tax payer gains because when all the costs and benefits are worked out, it's cheaper to build high quality cycle facilities than not to build them. Motorists benefit because more cycling results in fewer traffic jams. The advantages of cycling keep on adding up, but in order to reap these rewards it is necessary to build infrastructure which offers everyone a very high degree of both safety and convenience. If we're to achieve mass cycling amongst adults we have to enable it for children so that the pattern is established and can continue through their entire life. Not only is cycling good for physical health, but also for mental health. Happy and healthy children have a better chance of becoming happy and healthy adults. Teenagers ride home three abreast from their school 17 km away while young children riding a shorter distance in the opposite direction are overtaken by racing cyclists. 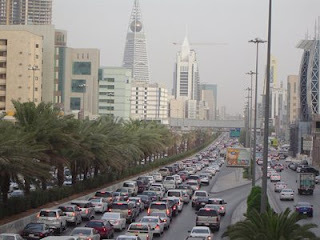 All these people, and myself as well, need the same infrastructure i.e. that which is easy to understand and offers direct and safe journeys. This consistent high quality experience can be achieved where there are cycle-paths and where there are not. Why aim for anything less ? A new version of the UNICEF report was published in April. 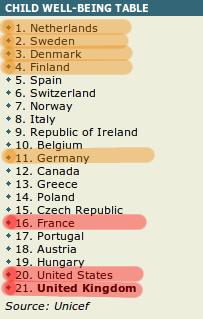 The Netherlands is still in first place, Finland, Sweden and Germany are still within the top six. Someone just sent me a link to the "final draft" of Ontario's new Bicycle Facilities manual. This is book 18 of the Ontario Traffic Manual, covering all aspects of design for all modes of transport. I have not read the other manuals and can only hope they are better than this one because unfortunately from the front cover page onward the manual for bicycle facilities demonstrates a remarkably low aspiration for cycling. Early in the manual people are divided into four potential types of cyclist and the authors recognize that 60% are "Interested but Concerned". This is a reflection of a lack of subjective safety, a theme covered many times on this blog. It is a good thing that Ontario has identified that future cyclists can only come from that part of the population who do not currently cycle. In order for cycling to grow, the experience of cycling has to become more acceptable to the masses who do not currently cycle. This is why subjective safety is important. Cycling has to not only be safe but it must also feel safe. For this to happen requires the frequency of conflicts between cyclists and motor vehicles to be reduced. It requires this to happen no matter where the cyclist is riding from or to. It is also necessary for cyclists' journeys to be efficient. It is often possible for cyclists to make shorter journeys than would be necessary by car or to have to stop less frequently for traffic lights than they would by car. It is possible for cyclists' journeys to take direct routes which are not in the same places as those taken by motor vehicle. It is possible for cycling journeys to be pleasant free of stress. That's the reality that we live in and it's what this blog tries to present to the world. But does Ontario actually intend to take this on, or are their proposed interventions too minor to make a difference ? The language of the document is slippery. Some of it sounds quite reasonable on an initial reading, but when you look closely it becomes obvious that the authors have rather low aspirations for cycling. There is an expectation that cyclists can share the roadway when both speeds and traffic volumes are at higher levels than we would experience. 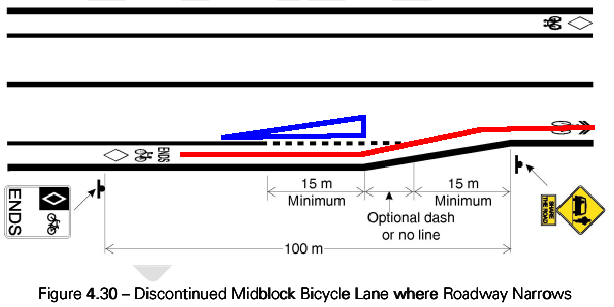 The authors think that it is only necessary to "consider" building an on-road cycle lane even with speeds of up to 100 km/h. The language of the document betrays the lack of ambition for cycling. Diagrams like this have been produced across the world. However, to encourage cycling the bands need to be adjusted so that cyclists have their own infrastructure at far lower speeds and smaller traffic volumes than suggested here. A passage which considers the needs of "Experienced cyclists (commuter or other utilitarian)" reads: "This group generally prefers direct, continuous facilities with minimal delay as is generally provided by the arterial road Experienced cyclists (commuter or network. Experienced cyclists may be comfortable on shared use other utilitarian) roadways with low motor vehicle volumes and speeds. However, users in this group typically prefer on-street bike lanes or separated facilities where the context warrants it." This sounds just fine until you consider what they're talking about. Our 85 year old neighbour's 80 years of experience is surely enough and her regular trips to the shops by bike are definitely utilitarian but I have never heard her express a preference for riding on arterial roads rather than the more direct, safer and more pleasant cycle-paths that we all use. Riding on road is equated falsely within this manual with making journeys which are direct and continuous and have minimal delay. There is no need whatsoever for that to be the case. There is a reason why fast cyclists in the Netherlands ride on the cycle-paths. Similarly, when writing about "child cyclists" the authors say "This group generally requires separated facilities free of conflicts with motor vehicle traffic. Separated facilities should be considered near schools, parks and neighbourhoods. Children under the age of 11 should be permitted to cycle on sidewalks since they may not have the cognitive ability or experience to ride on roads with motor vehicles by themselves." This also sounds almost reasonable until you realise how restricting this is. The need that childrens have for separated facilities is to be considered only near these specific locations. The freedom of children is thus to be restricted to routes between places that the road designers have decided in advance that they might like to go to. Canadian children "under the age of 11" supposedly need to ride on sidewalks because they lack some unknown cognitive ability while Dutch children regularly make school trips by bike from a far younger age. Indeed, my daughter rode 150 km out into the countryside on a school cycle-camping trip at the age of 11. Nothing special - almost all Dutch primary schools do this. There is actually no need for this compartmentalism. Children benefit most from exactly the same infrastructure as fast and experienced cyclists benefit from most. i.e. that which allows direct and convenient journeys to be made in safety. place relative to the car ? Something I've been meaning to write about for a long time is the strange North American fixation with painting "Shared lane markings" on streets. This is not infrastructure, it's just paint. What's more, it's not even paint which attempts to give cyclists their own space. Sharrows do not place any physical object in the way of drivers. They don't even suggest that drivers should steer clear of cyclists. Sharrows are merely a tokenistic attempt to pacify cyclists. They are not a feature of roads in countries which have a high cycling modal share. Sharrows give the appearance that something has been done but without any real change having been made to the road environment. 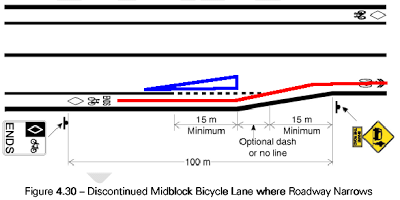 In Ontario, as shown in this picture, cyclists are to be encouraged to ride no further than 1 m from the kerb and drivers are actually to be encouraged to overtake cyclists within the same lane. The manual explains this in black and white: "if the travel lane width is 4.0 metres or greater, passing may be possible". And what type of road would this be ? "roads with higher traffic volumes, low to moderate speeds (40 to 60 km/h) and frequent intersections or driveways." Inferior to on-road cycle-lanes but sharing many of the same problems, sharrows are not the route to mass cycling. It's neither safe nor pleasant for a cyclist to be passed within the lane by a vehicle travelling at a considerably higher speed. So how does Ontario propose to deal with this problem ? 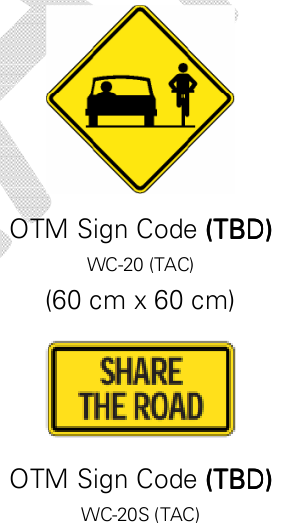 Answer: erecting signs which read "share the road" alongside the sharrows. This does nothing to improve the subjective or actual safety of cyclists. For narrower roads with less than 4 m lane widths, Ontarian planners suggest that the sharrows should be further out and cyclists be used as mobile traffic calming devices behind which motorists will have to wait until they can pass in safety. This on roads with 50 km/h speed limits. i.e. a speed which only a small fraction of the population can maintain for any period of time (the world one hour record for a reasonably normal bike is still under 50 km). If you have the guts to want to do it, then perhaps it is marginally safer to ride in front of frustrated drivers than to encourage them to pass within the lane. However it is unlikely to be a pleasant experience. Drivers who are in a hurry, stuck behind a bike and tooting their horns haven't necessarily seen a sharrow and don't necessarily understand why you are obstructing them. In any place where cyclists are used as traffic calming devices the dream of mass cycling will remain a dream. This is not the hassle free cycling that is required to encourage the entire population to ride bikes. This experience will do nothing to convert the 60% of the population which Ontario has identified as being "Interested but Concerned" into regular cyclists. The document refers to "paved shoulders". The recommendations for widths are vague: "should typically have shoulders between 1.5 and 2.0 metres of pavement width depending on the volume, speed and mix of vehicular traffic" is followed in the same paragraph by "practitioners may consider providing a minimum paved shoulder width of 1.2 metres after applying good engineering judgement and consideration of the context specific conditions." The lower minimum is available to anyone who thinks they have a "constrained corridor", but of course as we all know already, every place in the world claims to have "not enough space" and that includes Canada. Sometimes they make it too easy to criticise. Of the three examples that Ontario provides of real paved shoulders, two have a car parked in them. I'm happy to say that we don't have "paved shoulders" in the Netherlands. Or at least we don't have them as cycling facilities. The idea that cycling is made attractive by providing nothing more than a stripe of asphalt at the side of a road which may carry large volumes of high speed traffic is quite remarkable. It takes more than this. The optional separation by buffer of width 0.5 to 1.0 m is inadequate to lead to a high degree of subjective safety. We move on now to on-road cycle-lanes. These do exist in the Netherlands but they're generally older facilities and are not nearly so common as properly segregated cycle-paths (just 5500 km exist vs. 37000 km of segregated paths). You would expect to see such lanes in the Netherlands mostly on streets with fewer vehicles or occasionally in places which simply haven't yet been updated to remove them. They are found infrequently on busy roads or with frequently used parking because they are not suitable provision in such areas. this so that they are not misinterpreted as being for general traffic use." However, the diagram later on shows a slightly different idea. The desired width for a bicycle lane next to parked cars somehow shrinks to just 1.5 m, with a 1 m buffer (which may be reduced to 0.5 m) to protect from "dooring". This is simply inadequate. There also appears here a mention of the oft-mooted idea of cycle-lanes between lanes of cars. These apparently need to be just 1.8 m minimum in width. 2. cars passing being too close. 5. Nothing is done to protect cyclists at the junctions - the most dangerous places for riding. 6. How does a cyclist make a safe left turn at these junctions ? 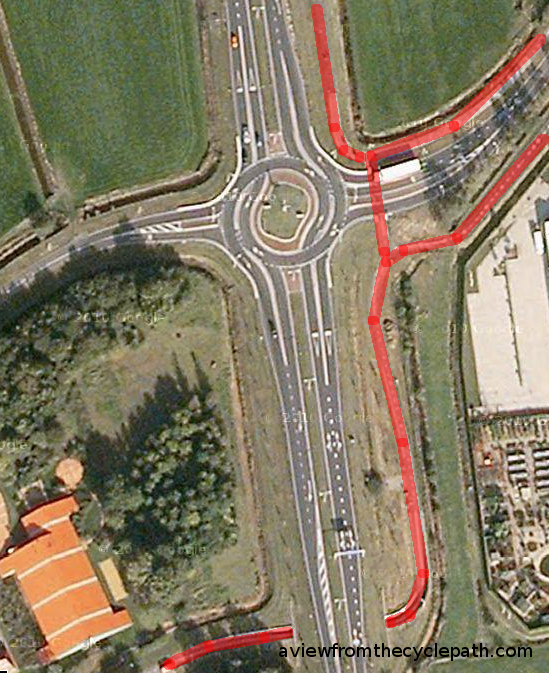 Added red and blue lines show how the paths of cyclists and drivers clash at a junction designed like this. It's just not good enough for lanes to disappear and signage isn't enough to prevent the problem. In this example a cycle-lane disappears right at the most dangerous point - where the roadway narrows. The Ontarian designers place all emphasis on avoiding a collision on a cyclist who can turn his head by 180 degrees and judge the safe moment to pull left into other traffic. This is simply not a safe arrangement. I've added a blue triangle to show how kerbs on the road could be used to make this merging safer by forcing drivers to pull to the left. Another example of designing in conflict. 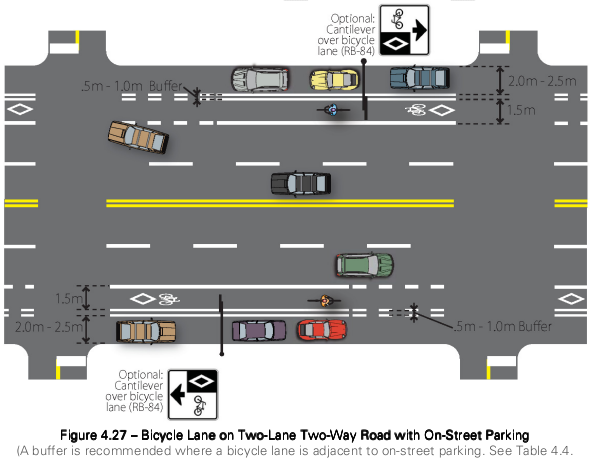 Cyclists heading straight on should not expect drivers turning right to merge into their lane. This arrangement of lanes requires both cyclists and drivers to be able to see behind themselves to avoid colliding with one another while they change lane while they must also look forwards to see what vehicles in front of them are doing as they may be adjusting their speed to merge or slowing for a red traffic light. From the point of view of sustainable safety this design is extraordinarily bad because it relies on everyone behaving perfectly at all times. For this to work without injuries, no-one must ever be tired or distracted. It's the precise opposite of the Dutch principles which seek to make roads safer despite their users' misbehaviour or mistakes and self-explanatory so that users do the right thing without having to take notice of excessive signage. These examples were all found within the first third of the manual. There are far more examples of bad design which I have skimmed over and while it would be amusing to go through all of them this would also be very time consuming so I'm stopping here (unless Ontario wants to sponsor me to continue, that is). I've read a few design manuals in my time and unfortunately I have to say that this is one of the very worst. The examples above come just a third of the document. Flipping through more of the pages reveals seemingly an endless stream of material which is just as bad and in some cases obviously worse than that above. Take advice from people with experience. Learn from best practice. 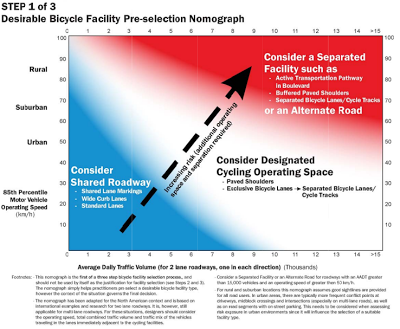 Ontario: don't accept this document as your future guide to building bicycle facilities. It is inadequate to the task in more ways than I have time to document. If your aim is to achieve a higher cycling modal share, encourage a wider range of the population to cycle and to improve the safety of your cyclists then you desperately need to start again on your manual. Instead of seeking out only inexpensive "solutions" or inventing new ideas, and instead of being influenced by countries which have similarly low cycling modal shares to your own, please take a look first at what has been achieved here in the Netherlands. It makes absolutely no sense at all to ignore the most successful practices. A good start would be to buy copies of the CROW manuals and read them thoroughly. These are the best documents that you'll find anywhere about cycling infrastructure. However, don't stop at just reading books and websites and be aware that the real life experience is only hinted at by what you'll read. You also need to know how it feels to use the best cycling infrastructure in the world and you'll find out how the best infrastructure explains itself and does not need the number of signs that you are planning to install. You need to aim high in order to achieve future success. This is the reason why we offer cycling infrastructure study tours - so that professionals such as yourselves can see what best practice is and avoid making expensive mistakes. A few days after writing this, I realised that the same consulting company was involved as had been paid to put together another inadequate plan. Not every organisation which claims expertise actually has it. I really am willing to go through the rest of the manual for a fee. It could be instructive to point out all the problems. However, I think time would be better spent by Ontario setting about writing a proper manual for cycling facilities. Attempts to "Go Dutch" in the UK continue to fail because what it really means to "Go Dutch" continues to be misunderstood. It's very important not to see what the Dutch have done as a collection of disconnected pieces of exceptional infrastructure in a few places, but as an accessible and convenient cycling network for all which goes everywhere. This is how the infrastructure has attracted the entire population to cycle rather than cycling being a minority activity as in other countries. Unfortunately, campaigning under a banner of "Go Dutch" got off to a bad start in the UK as no sooner did a campaign for Dutch infrastructure start than the main campaign group supposedly behind it immediately lowered their target from something akin to what the Dutch have to something else altogether. This turned "Dutch" into nothing more than a slogan. Councils have also started to describe any proposal as "Dutch". Now the same thing has happened courtesy of commercial interests who have a natural desire to maximize their profits. They are also treating "Dutch" as a slogan and seemingly any new infrastructure proposed now is described as being "Dutch" even if it is far removed from real Dutch infrastructure. Campaigners need to be careful about what they're being fed as these companies don't necessarily have a desire to improve things for cyclists. But campaigners also need to get their own houses in order and make sure they are asking for something truly Dutch. If you're not campaigning for or building something which will result in Dutch conditions for cycling then don't use the word "Dutch" to describe what you are doing. Turbo roundabouts are a junction design which is intended to deal with large numbers of motorised vehicles. They are not a cycling intervention and have in fact been criticised by cyclists in the Netherlands due to the danger that they pose to cyclists. I first heard of turbo-roundabouts being proposed for the UK as a cycling intervention due to two bloggers having picked up the term more than a year ago. It prompted a warning from me to them that it was a bad idea. Since then it came come up again in April as a "walking and cycling officer" in Bedford made an absurd proposal for a turbo roundabout without any cycle-paths at all as a cycling facility. He quite rightly came in for criticism about this. This roundabout is apparently designed to be "safe for all road users, not just cyclists". This is an interesting turn of language because while Britain's roads are similar in overall safety to Dutch roads, and motorists in the UK do not experience a higher injury rate than Dutch motorists, the safety of cyclists is considerably worse in the UK compared with the Netherlands. This is why cyclists were the only people campaigning to "Go Dutch". The most startling thing about this design is that while it looks superficially similar to how a theoretical Dutch Turbo-Roundabout might look, it doesn't so closely resemble infrastructure which you find built in the Netherlands. There are a few detail differences, such as that crossings for cyclists have an unnecessary wiggle. However, more importantly from the point of view of cyclists is that in most cases, people riding bikes in the Netherlands can expect to be kept well away from Turbo Roundabouts. They are not normally crossed as frequently by cyclists as might be the expectation of people who see this image. A cyclist travelling North-South across this example has to cross four lanes of traffic as well as negotiate the wiggle in between the two separate streams. A cyclist travelling West-East has to cross three lanes, again with a wiggle. 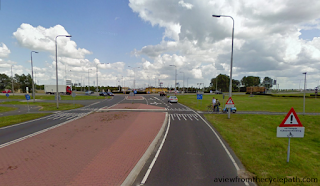 Crossing more than one lane at a time, particularly of traffic which is leaving the roundabout at different speeds, is what causes Turbo Roundabouts to be unsafe for cyclists and this is a large part of what has caused complaints by cyclists in the Netherlands. This was known to be a problem so long ago as 2008. A real turbo roundabout in the Netherlands. No cycle-paths here because while it's in a city, this is a junction between large roads with no bikes in the vicinity. Real turbo roundabout in the Netherlands. No cycle-paths because cycle-routes are elsewhere in this area. Real turbo roundabout in the Netherlands where a major road intersects a residential area with probably quite high cycle-usage. 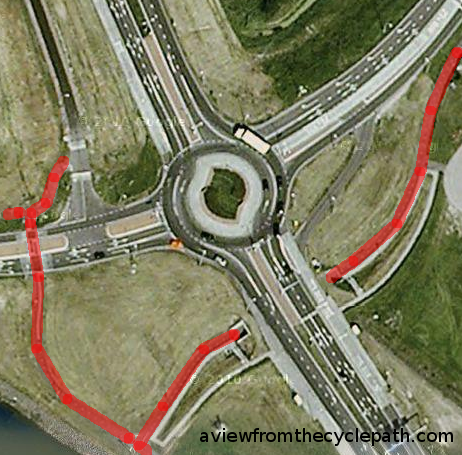 Cycle-routes completely avoid it, using two extra bridges over the water as well as a tunnel under the road. No crossing on the level. 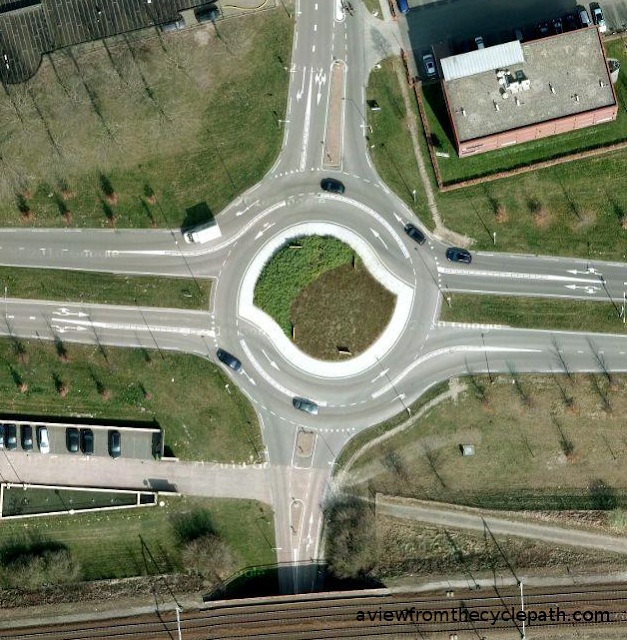 A real turbo roundabout in the Netherlands in a rural area with probably lower cycle traffic. Cyclists crossing West-East have a tunnel, those going North-South have to cross the road on the level in a similar way to that pictured in the example image above. The turbo roundabouts above are simply the first five that I found on Google Maps. It would take time to find and comment on all the turbo-roundabouts that exist and I don't propose to do so. From my experience of cycling and driving in the Netherlands the examples above are a representative sample. Note first of all that three of the five real turbo roundabouts shown above have no interaction at all between cyclists trying to cross the road near the roundabout. Either these turbo-roundabouts are located some distance away from cycle-routes or an elaborate and completely separate route has been provided for cyclists so that there is no interaction on or near the roundabout. 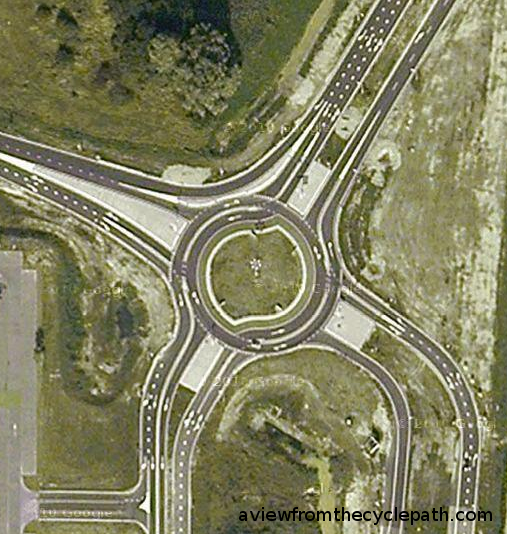 Two out of five real turbo roundabouts featured above do have a crossing for cyclists on the level with motor vehicles. In both of these examples, the Google Maps imagery shows cyclists crossing two lanes on the road towards the roundabout, where visibility for drivers is best, and just one on the exit lane from the roundabout, where visibility for drivers is less good and where there is a greater danger. Also of course where cyclists cross they do so in a straight line with no wiggle to negotiate in-between the two sides of the road. one lane, a change in road level and sign to warn drivers. However even that is not the end of the story. The Streetview imagery for the last example shows that though two lanes are shown as having to be crossed at once on the aerial photograph, this junction was actually modified later on so that cyclists had just a single lane of traffic to cross. This removed the danger of a double crossing at this point and improved safety for cyclists. 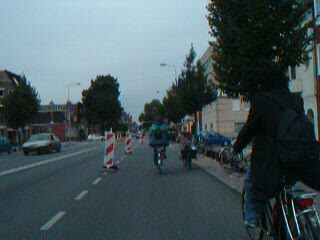 The problems due to interactions with cyclists at junctions like this are quite well known in the Netherlands and remedial action has been taken in many locations to reduce the danger of crossing more than one lane at a time (this is true of urban as well as rural locations). In most cases in the Netherlands, cyclists are either nowhere near the turbo-roundabout because the road and cycle-path networks are specifically designed to keep them apart or bridges and tunnels are built to allow cyclists to carry on their journeys at some distance from the roundabout. This leads to a generally high quality experience for cyclists. It is rare that one has to cross at a difficult junction and because of the unravelling of bicycle routes from driving routes it is common that cycling journeys can be made over quite long distances without having to stop at all. Roundabouts which are on cycling routes are overwhelmingly not of the turbo design. They are generally of a smaller scale and usually used by fewer motor vehicles than a turbo-roundabout is designed to deal with. What's being proposed for the UK? 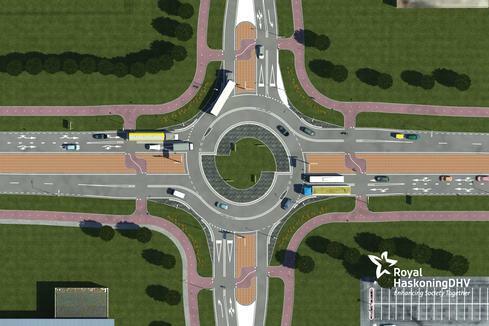 Look back to the proposal for the UK and you'll see that they are suggesting that one roundabout could have four crossings, something which I've not yet seen with my own eyes on a turbo roundabout in the Netherlands. They also show crossings of double exit lanes which I've also not personally seen but I do know that this existed because it was the dangerous situation so caused which resulted in complaints about the safety of a turbo roundabout in Eindhoven more than a year ago. What's more, the proposal says nothing about where this roundabout might be built. In the Dutch examples these roundabouts are not generally to be found in areas of heavy cycling. Normally they are positioned either out of town or in areas where few cyclists ride. Where turbo roundabouts are required closer to population hubs effort is taken to keep cyclists away from these roundabouts. 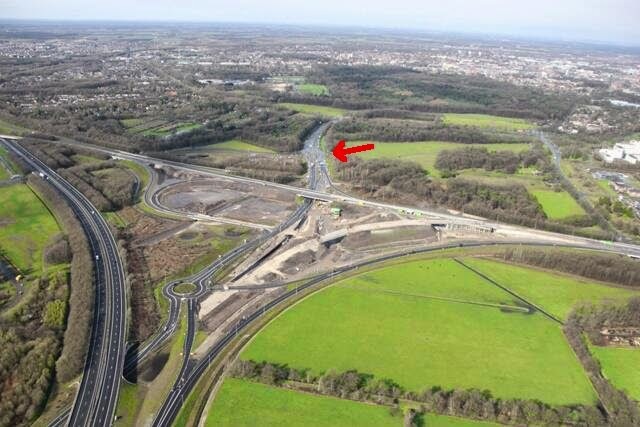 The proposal for the UK does not match what is normally built in the Netherlands. How can you "Go Dutch" by doing something inferior to normal Dutch practice ? completed well ahead of schedule and under-budget. 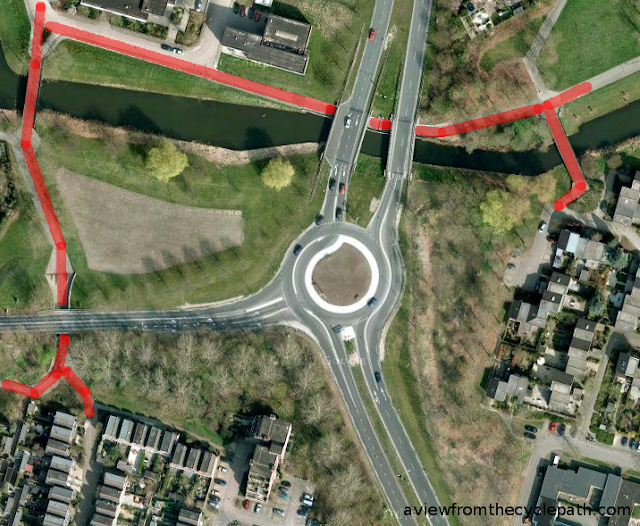 Turbo-roundabouts are not facilities for cyclists and in the Netherlands they are not built as facilities for cyclists. Note that after the roundabout opened there were complaints about the danger caused to motorcyclists. A Dutch based company must surely include staff who are aware of the problems caused for cyclists both due to turbo roundabouts and crossing more than one lane. However, this company is proposing a combination of both of these things as an answer to calls by British cyclists to "Go Dutch". This is disappointing to see. While this may be proposed by Royal HaskoningDHV for the UK, I don't think the same company would propose such a design in the Netherlands. It appears on the face of it that they this company is jumping on the bandwagon of current "Go Dutch" campaigning in the UK. Actually, we shouldn't really be surprised by any of this. Royal HaskoningDHV describes itself as a "project management, engineering and consultancy service provider". The company does not exist to encourage cycling - their other interests include such diverse things as aviation and mining, oil terminals and naval bases. That this company has Dutch roots is almost entirely irrelevant so far as their ability or desire to build cycling infrastructure elsewhere is concerned. They will build anything you want them to build. Royal HaskoningDHV has offices in 35 different countries. They are one of several large international engineering companies which compete for contracts across the world. None of these companies seeks to lead by taking a moral position, that's not how contracts are won. Rather, the work comes almost entirely to those who present the best price for doing the required job to whatever local standards happen to apply. I have no reason to think that Royal HaskoningDHV are anything other than a very good engineering company, and I've no complaint about that. That's what they should be. However, we have to be very careful about attempts by any companies to assimilate campaigning issues as their own in order to make sales. Campaigners should not expect leadership in cycling from an organisation like this and must be skeptical about proposals like this, whichever nation that company is based in. A positive change can come only if campaigners convince politicians to ask for standards to be changed so that future road and cycle-path designs are improved and so that the local standards which engineering companies are required to work to are good enough to make sure that those companies can only build appropriate infrastructure. Change should not be expected to come about due to commercial interests of companies. Dutch traffic experts and associated companies currently see turbo-roundabouts as a good export opportunity. Royal HaskoningDHV are simply following this trend. They're currently talking this idea up as having something to do with "Dutch" cycling because this might help them to win a contract in the UK at the moment, not because turbo-roundabouts have ever had anything to do with cycling. The Dutch Cycling Embassy style themselves as "the world's cycling experts". When the organisation was first proposed I was very enthusiastic. Many genuine experts from the Fietsberaad and other organisations were involved with the Embassy and it appeared that this would help with spreading information to other nations about how the Dutch had made cycling so safe, convenient and commonplace. A number of bloggers including myself were contacted by them and various ideas were mooted at that time about somehow helping to represent the new organisation. I helped with some of the initial publicity by travelling to meetings at my own expense and writing positive articles on this blog about them. However, those articles are no longer on my blog. I deleted them several months ago when I realised that this had become very much a one-way relationship. The organisation might still want people like me to blindly offer support but it appeared that their aims had diverged quite widely from my own. I now feel disappointed with what the Dutch Cycling Embassy has become. In my opinion, they are now overly commercial. Marketing of Turbo Roundabouts as "Dutch" and therefore a good thing for cycling is not the only example I've seen recently of promotion of the wrong things as "Dutch". because the cycle-path had been dug up. Buses were kept out. For example, on a recent "technical excursion" by British designers and policy workers to the Netherlands a presentation was given by a Dutch expert about "combined bicycle and bus infrastructure". Now I was not invited to this meeting and I've not seen any record of exactly what was presented, but frankly the title could be enough to mislead. While it is common to combine buses and bikes in one lane in other countries, I've never actually seen anything that I'd describe as "combined bicycle and bus infrastructure" in the Netherlands. The only time I've ever ridden in a bus lane here was when the bicycle path was closed for repair and buses were excluded from the bus lane in order to make a temporary safe space for cyclists. To combine two forms of transport which are so fundamentally incompatible as bikes and buses always causes danger to cyclists. It doesn't happen in the Netherlands because it is not convenient, safe or pleasant and it should not be pushed elsewhere either - especially not as "Dutch". Shared Space is another example of something which is frequently promoted as "Dutch" but which makes up another of what is an increasingly long list of things which are not really good examples of design for cycling. In the recent past I've watched as the "Dutch" ideas of campaigners were hijacked and misunderstood first by the London Cycling Campaign and then by Transport for London. Now it would appear that these hopes and dreams of real change have been hijacked once again by... commercial interests of Dutch firms. The function of embassies has always been to promote commercial interests and I suppose I was naive to expect that this embassy should operate in any other way. The Cycling Embassy of Denmark, which the Dutch copied, is itself a commercially driven enterprise and it has successfully promoted Danish companies around the world. I actually have no argument with this happening on behalf of either the Dutch or the Danes. They are not charities and tax payers of both nations can rightly expect to get something back for their investment. However, I think there needs to be clarity about what these organisations are. Both embassies have been quite successful at painting a picture of themselves as something other than commercially driven, but as campaigners we should be wary about any organisation which gives out hospitality and advice on behalf of a nation's taxpayers and the companies who they are in partnership with. When engineers or politicians accept this hospitality they are being sold a commercial message. To get people in other countries to cycle is not about branding cycling or infrastructure as "Dutch", it's about providing the same opportunities to cycle as the Dutch have, The best chance for this to happen is to provide infrastructure which enables mass cycling just as effectively as real Dutch infrastructure. Marketing and hype, commercial interests and simple misunderstandings have combined to form a confusing fog over what Dutch cycling infrastructure is and what it achieves. Campaigners need to be clear about what they want and not blindly accept things that are marketed as "Dutch". This, of course, was the theme of my blog post two months ago in which I listed some of the other examples. There is a risk of countries moving from having infrastructure which is unattractive for cycling to having fake "Dutch" infrastructure which is almost equally unattractive to cycling, and the benefits of this will overwhelmingly be seen in the bank accounts of the companies who installed it. If Britain, or any other nation, is truly to "Go Dutch" they can only do so with knowledge of what works in the Netherlands, how it works, and how to design it. To result in worthwhile change, standards need to be set very very high. Whatever infrastructure results from this needs (eventually) to be ubiquitous. It must aim to help everyone on every journey. If inspiration comes mainly from allowing commercial enterprises to propose what they think will be easy to sell, which probably means a few individually large, impressive and profitable headline projects, then it is likely that the result will be that of remaining "40 years behind" so far as cycling is concerned. We have offered our own Study Tours for roughly eight times as long as the Dutch Cycling Embassy has been in existence and twice as long as the Danish Embassy has been established. We really are completely independent. Our tours wouldn't even be in this country if there was a better place to do them - we would have moved to that other place instead. We provide a considerable amount of information freely readable on this blog but that isn't enough on its own. It is only by seeing and experiencing that the real learning takes place. On our tours we show you both good and bad examples of infrastructure and we try to explain why they are good or bad. These tours are genuine bicycle tours on which participants use the infrastructure which we are demonstrating because it is the experience that counts, not how much time has been spent looking at slides. We aim to give impartial advice. Why not take advantage of our years of experience ? There's a handy online map of all known turbo roundabouts on which you can find Google Maps photography of each. Note that you have to look only at those with purple flags if you want to see "true" turbo roundabouts and not hybrids of some kind or another. Occasionally people ask us why we charge "so much" for our study tours. I ask in return what they think their time is worth and what they think ours is worth. This is something we have done for many years as a passion, not for commercial gain. Initially we ran the tours at a loss in order to make them available to as many people as possible. It cost us many thousands of euros to do this but we found that even then we could not make it attractive to British politicians. We now have to run the study tours at a profit because otherwise we could not afford to run them at all. However once we take out our meagre expenses, it is rare that the tours leave us with anything even close to minimum wage for our time. Still too expensive? We don't receive any funding at all from government. Actually it works in quite the opposite way - we pay taxes to the government, some of which they use to subsidize the tours and presentations offered by the Dutch Cycling Embassy. We receive a lot of unsolicited email from companies trying to sell something, including items from Dutch engineering and design companies who think we'll provide free advertising to them by hyping large projects they've been involved in. These big projects get quite enough hype elsewhere and I'm not going to add to it. The most important thing about Dutch infrastructure is its ubiquity - but I guess that doesn't have the same potential for quick and easy profit.